Stadium comes first, and then comes the team. Built in 2014, Spartak Stadium has turned into a legendary battlefield hosting FC Spartak Moscow. The stadium depicts club’s glorious history and is the home of 45,000+ of its dedicated supporters. Spartak Stadium is a premium-class arena that meets all necessary UEFA and FIFA requirements. It traditionally hosts FC Spartak home games including Russian Premier League as well as UEFA tournaments. The stadium is also used as the home arena for Russian International Team when it comes to exhibition and FIFA Cup matches. Black section includes VIP seats for special guests, celebs, and politics. Pink seats refer to Category 1 tickets. They are located on the long-side upper and lower seats. Green colored zone refers to Cat 2 seats. They are a bit cheaper and located in each corner occupying upper and lower seats. Violet seats represent Category 3 on the short-side upper and lower seats opposite each other. Orange seats refer to Cat 4. Those are the cheapest seats that are located on the upper row only. The seats on the short side located on the left from VIP are the home for local supporters. While sectors on the right are for guest visitors. The stadium is often used as the huge concert hall for some huge events like rock concerts and special shows as well. Visitors can benefit from advanced facilities in addition to food courts, WCs, first aid rooms, police departments, etc. Note: smoking and drinking alcohol is prohibited. StubHub lets you buy tickets without leaving your chair! Simply make a couple of clicks and book a seat to become a part of the most thrilling football match. Millions of fans choose this service every time they plan a trip to another city to support their team in international arenas across the world. Visiting the stadium’s official website would also be a good idea. Here you can check the actual schedules as well as upcoming matches, concerts and other events. Simply click the “buy tickets” button and choose a row you need featuring the most suitable price. The navigation looks pretty simple and convenient even for newbies. The ticket price usually depends on the tournament and visiting team. 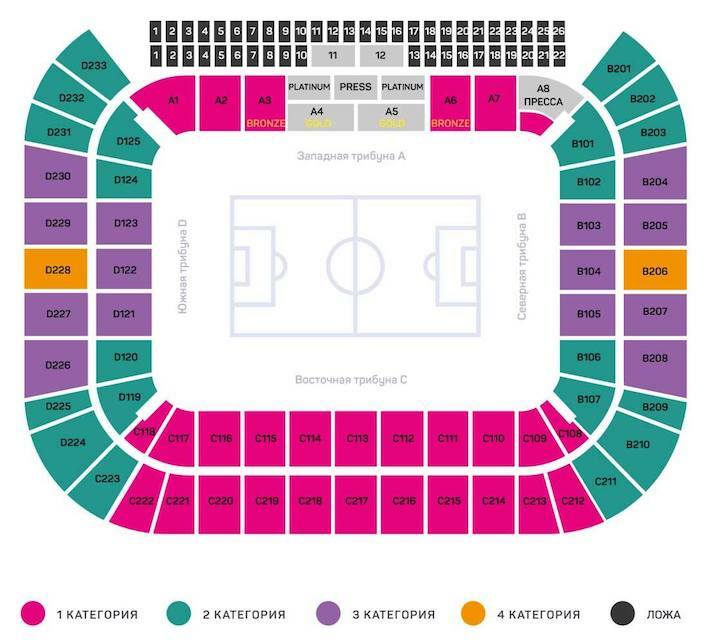 However, you are very unlikely to pay more than $50 for the best seat on the Spartak Stadium. Short-side upper and lower seats usually cost up to $12. The price for better seats located on the long side featuring better view rarely goes higher than $35. Finding a room for one night will hardly ever be a problem thanks to Booking.com. It does not matter what your final destination is. A solid service provides thousands of accommodation offers for any budget. Whether you are looking for the cheapest variant to stay in Moscow or require premium-quality services, check our list of best available offers. Mini Hostel – a nice choice for tourists with a limited budget. One night here will cost you $40. Located 10 minutes’ walk from the stadium, the venue has a summer terrace with BBQ. Apartment on Aviatsionnaya 68 – located only 800 meters from the Spartak Stadium, this venue is very close to VTB Arena as well (another popular stadium in Moscow). Free Wi-Fi, ironing and heating facilities look pretty well for only $48 per night. Apartment G-Kvartal Schukinskaya – the hotel represents a network of apartments located 5 minutes’ walk from metro stations nearby. It will take you about7 minutes to get to the arena and 30 minutes to the city center with the main places of interest and attractions. A good option for $47 per night. Boutique Hotel Pechora – Komi – $80 per night for a large-sized bed in addition to great location looks like a bargain. The stadium is nearby as well as the beach where you can wind down if the weather is fine. Happy Hotel – is about 1 km from the Otkritie Arena. It will take you about 7-10 minutes to get there without using any transport. Local visitors appreciate great continental breakfasts that are served on a daily basis. The price starts from $72 per night. Apartments Near Stadium – a good choice for people seeking privacy right next to the stadium. You will benefit from the overwhelming river view right out of the window. The view and other facilities will cost you $239 per night. Spartak Stadium is easy to reach via several traditional ways including various types of public transport in addition to car or taxi. The prices are relatively low if compared with European rates. The arena itself is located in the north-west of the Russian capital inside the MKAD. The distance between the stadium and the city center is 14 km. By Tube – Spartak metro station is the nearest to the stadium. It is a part of the purple line 7 of the Tagansko-Krasnopresnenskaya Moscow tube network. It is not far from the downtown while the rice for one ride is only $1. By Bus – buses can be a better way to get to the arena especially on the matchday. Some metro stations can be closed before and after the game. Check for the 70 or 248 bus numbers. They will take you directly to the stadium. By Tram – trams are also rather popular in Moscow especially when it comes to traffic jams. Up to 5 different routes are available for visitors. All you need is to seek tram numbers 7, 15, 28, 30 and 31. They all make a stop about several minutes’ walk from the destination. By Taxi – although it would be a bad idea considering congested roads especially on the matchday you can still take a taxi. It will cost you around $15 to get from the downtown right to Spartak Stadium. By Train – visitors, who travel by train, usually arrive at one of the 9 available railway stations all next to the city center and metro. Tushino railway station is next to the stadium. So, you can get there directly from the railway station. By Plane – Vnukovo, Domodedovo, and Sheremetyevo are the main destination for international visitors who travel to Moscow by plane. All three airports have special services that will take you to the nearest metro station. You can use Airexpress to get to the city center. The price for one ticket varies from $10 to $150 depending on your demands. You can check for detailed Airexpress information on the official website. During the sports event parking near Spartak Stadium can be a problem due to high demand. However, there is always a solution. The approximate matchday paid parking price near the sports venue in Moscow is $10. The Russian capital is a modern and up-to-date city highlighting a rick world of gastronomy introduced in city’s numerous posh restaurants, traditional Irish pubs, authentic Russian cafes, venues serving Asian and European food. The food service is high while the prices are comparatively low. Check our selection of the best cafes and bars next to Spartak Stadium. Kruzhka Beer Restaurant – a legendary bar & restaurant network popular with both local and guest fans. The pub chain has been operating for decades and turned into a hospitable place to watch a match, have a couple of beers with snacks and try local BBQ cuisine. Bar BQ Café – located not far from the stadium, this venue serves fast-casual BBQ foods for all tastes. The meals are based on fresh ingredients and different types of meat. An extended menu highlights good quality in addition to nice interior and general foodservice. Traveler’s Coffee-espresso bar – a cozy and hospitable venue for dedicated coffee lovers. It does not look like typical coffee shops. The café boasts its unique design in addition to a selection of special snacks for your aromatic cup of espresso or cappuccino. “Truffle cafe” Bar & Restaurant – the venue depicts an award-winning mixture of high-label cuisine in addition to selection beers and wines. Try local original burgers with a glass or white dry wine or explore local meat snacks with a glass of red. Mitino Territory – Mitino hotel complex features its own dining territory with a posh restaurant for the whole family. It is a good place to spend time with your friends and try sushi and European cuisine after local attractions and outdoor activities. Visitors can choose from different excursions and exhibitions. Spartak Stadium tours are available in various programs in addition to the FC Spartak Hall of Fame. You can opt for group tours as well as individual excursions. Some of them include visiting local football museum. A group stadium tour + hall of fame. You will visit dressing rooms, stadium lobbies, the tunnel, coach and commentator’s seats. The Hall of Fame is included in the program. Adult tickets cost $12 while tickets for children will cost only $5. An individual Spartak Stadium tour + Hall of Fame. The program is actually the same with some slight differences. You are one-on-one with the guide who will show you some special places and tell you secrets that no one ever knows. You will also visit the Hall of Fame featuring all trophies and historical facts connected with Spartak glorious past. The price ranges from $25 (adults) to $12 (children). The Hall of Fame – check detailed description of the tour in the next section. All tours are available from Tuesdays to Sundays from 11:30 a.m. to 4:0 p.m. You can book tickets online. The Hall of Fame is actually the stadium’s main museum. It depicts decades of FC Spartak glorious history in addition to its trophies, newspaper lines from the past, various samples of old-school uniform and more interesting things to see. The ticket prices range from $5 (children) to $10 (adults). The Hall of Fame is opened Tue-Sun from 11:30 a.m. to 4:30 p.m.
Also known as Red-n-White Store, FC Spartak fan shop is located far from the stadium. However, it will hardly be a problem considering the availability of its official web version. Here you can choose from clothes for men, women and kids, sports accessories, jerseys and other products related to FC Spartak. The Russian capital is certainly worth visiting when it comes to historical monuments, cultural attractions, and entertainments. The city hosts endless museums and galleries related to different culture epochs, historical monuments that depict the glory of the country in addition to its past. Moscow offers a diverse selection of places to spend time. Hop-on hop-off sightseeing tours are taking tourists by storm. They are available in all major cities around the globe. Moscow is not an exception. Simple hop in the top open bus and follow the route that highlights all major places of interest from the Kremlin and Arbat to the Moskva River and Bolshoy. One adult ticket will hardly cost you more than $20. The Red Square – it is one of the most visited squares in the world. The center of Moscow is the heart of the entire country. The Red Square usually hosts all major nationwide events, celebration s, and concerts. Here you can touch country’s history and witness its glorious architecture. The Kremlin – What is the first thing associated with Russia and Moscow in particular? The Kremlin, of course. It is the milestone of everything related to Russia depicting thick walls resistant to any attack as well as its high towers that symbolize power and strength. Arbat Street – the place where both locals and city guests prefer walking and enjoying the evening chill. Here you can do some shopping in branded stores as well as spend time in cozy cafes or simply listen to street poets and artists.